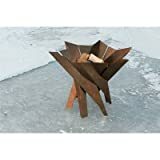 I doubt you'll witness any mystical birds rising from the ashes in this cool new Phoenix Blossom Fire Pit, but you will enjoy its stunning beauty as the flames rise forth. 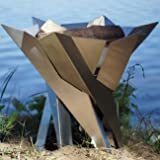 This majestic fire pit is a stainless steel outdoor sculpture that also doubles as a convenient spot to burn wooden logs in the center. It's unique stainless steel design is a result of advanced sheet metal processing technologies and features a removable bottom for easy cleaning. Perfect for sitting around all year long with friends and family who will most likely still be staring at their phones.